We spent the night at the airport in Barcelona after arriving there at 11pm the night before. When the ticket station opened up at 7:30 a.m., we were almost the first in line. We went through all the clearance stations and had some breakfast as well as some duty free shopping for last minute gifts. It felt so good to be on the way home. Jessy had her migraine headache again on the flight, she took some pain pills but had a difficult time going to sleep, luckily we had the four seats in the center of the airplane to ourselves and within half an hour Jessica was able to get sleep most of the way home. During our layover in Philly, Jessica and I had a cheese steak, then caught a flight home. Will we ever do this trip again? Yes, we would do several things differently; mainly allow ourselves more time to enjoy the towns, to enjoy the experience with other pilgrims and to share stories. At times we felt rushed, while we did not have a complete rest day we did do some short days, which aside from Jessica's pain they were the most memorable days. Would I do it on a bici again? Yes, for me personally I like the feeling of the wind at my face, it tells me I'm moving, but I think next time I will walk the first two stages. Definitely from SJPP to Roncesvalles, then from Roncesvalles to Pamplona, then pick up the bicis there. I also think the last stage into Santiago De Compostela must be walked. Something else to think about for a future camino would be the Northern Route, where the Bay of Biscay is at your right and the Picos de Europa at your left as you walk or ride to the west towards Santiago. 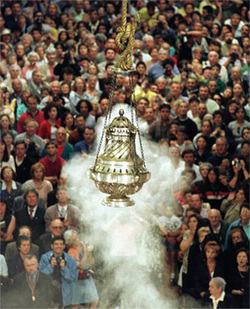 We were disappointed in not being able to go into the Cathedral in Santiago on our final day, not being part of the Pilgrims mass as well as not seeing the Botafumeiro as it swings slowly after the Pilgrim's mass. We had unexpected delays, but because of the delays we had unexpected experiences. For me personally having the opportunity of taking part in a corrida was definitely a check high on my personal bucket list. Without a doubt there would be differences, there are items I should have taken such as a very good rain jacket or a Poncho. There are items I wished I had not taken. I thought I was going to have time to watercolor, but I never touched them. You really only need three shirts, and maybe 3 shorts at most with one being cycling shorts. One pair of shoes and sandals to give your feet a rest is enough. Two pair of socks is plenty. Often I would start my shower by wearing what I had on and soaping it down then rinsing it off; while they dried I had my second set of everything. My thoughts on food,there was lots and not enough. While every town had the special peregrino dinner, they were expensive, usually at 11 Euro per person ( about $15 US) expensive if you are on a pilgrimage. The few times Jessy and I had the Peregrino Dinner, we usually shared it. When you do see a supermercado, do stop and get your needs for the day or two. For us it was usually a can of squid or octupus and a baguette. This will always fill your stomach for several hours. Fruit, lots of fruit everywhere and great prices, especially cherries. One of the reasons to take longer breaks is so you will have time to cook your own meals often , just about all albergues have a kitchen. Most also have the necessities such as oil to cook with and the likes of salt, pepper and spices, as well as pasta to cook left over by other pilgrims. Yes, there were painful days, soreness in my legs, tightness on my shoulders from the riding position, so much pain on my hands that I could not hold a pencil or the stake for our tent. For walkers, nightly I could see their pain on their blistered feet. But without a doubt, I want that pain again. Now a month later I think of experiences I had and I think daily back to my pilgrimage with Jessica. I often think back to situations and how I now must act, must feel, must be aware of things and others around me. How my words and actions affect others and the reversal. It is difficult to be the way we should be, kind and conscience of others at all times. But because of my experience I am at minimum able to recognize how I should conduct myself with my family and with the people that make up my life. Every time we needed help there was always someone there. From Jose when we got our first flat, to the Hosteliers in Roncesvalles when we came in so late wet and worn out, to the nurse in Villadangos with advice for Jessica's needs. If we had a flat, another rider would ask if we needed help. When we blew out an inner tube, the host in San Francisco de Asis got on the phone to friends in Burgos to make sure we had a place to stay as well as where to get our bikes fixed. The support for the peregrino is at every step mostly by other peregerinos or by others that have experienced the trip. Trust your camino - there will always be someone to give a helping hand. I will never forget my camino.